Amateur Piano Competition Winnner appears in the UK this summer Back in August 2012, two talented amateur pianists shared joint first prize at the 2012 Amateur Piano Comptition presented by Pianist, Yamaha and Chetham's Summer School. One year later, one the winners, Robert Finley (pictured), returns to perform in public in Manchester and London. At the Finals of the Competition, which were held at the Royal Northern College of Music concert hall, Finley performed before an internationally renowned judging panel comprising Noriko Ogawa, Michael Roll, Murray McLachlan and Pianist magazine editor Erica Worth. He performed on Yamaha's flagship CFX concert grand. Thomas Yu was the other joint winner. Following the competition final, Erica Worth commented, 'The standard was way beyond our wildest dreams. The finalists are truly outstanding amateurs; they play like true professionals. It's so inspiring to hear the quality of classical music being played in living rooms up and down the country!' Finley, a retired electronics engineer from Boston, Massachusetts, will give a recital at Chappell of Bond Street, London, on 13 August and at Chetham’s School of Music on 18 August. He’ll then sink his fingers into the first movement of Chopin’s Piano Concerto No 2 at Manchester University on 19 August, joined by the Manchester Camerata. 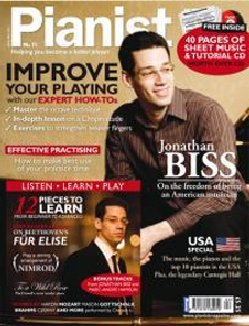 Asked in an interview in Pianist No 69 about the challenges of choosing repertoire, Finley said, ‘I play music that I love playing.